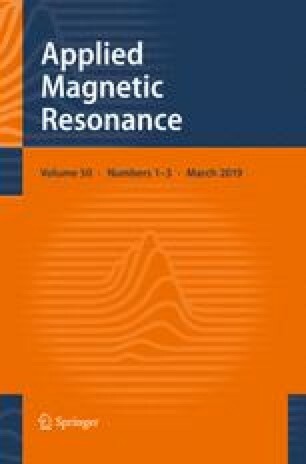 Calixarene sulfonic acid complexes with acetic acid CH3COOH and its derivatives CCl3COOH, CF3COOH were studied by nuclear magnetic resonance (NMR). The formation of guest–host type complexes was shown by magic angle spinning (MAS) NMR and high-resolution NMR techniques. Increase in calixarene molecule conformational flexibility with moisture content rising was observed by 13C MAS NMR. Consequently, CCl3COOH, CF3COOH molecules vacate calixarene cavity at relative humidity RH > 33%. While the complex with CH3COOH remains stable up to RH = 64%. The self-diffusion processes were investigated by 1H pulsed field gradient technique. Spin-echo attenuation curves show non-exponential shape indicating the occurrence of several phases with a different translational mobility. The existence CCl3COOH, CF3COOH acid molecules inside the calixarene cavity leads to average self-diffusion coefficient D s aver reduction compared with pure calixarene sulfonic acid. The values of D s aver for the CH3COOH complex are close to average self-diffusion coefficient of calixarene sulfonic acid. From D s aver proton conductivities σcalc on the basis of the Nernst–Einstein equation were calculated. Calculated σcalc and experimental σexp conductivities are agreed well in the RH range from 33% to 75%. At low water content (RH = 10%) σexp is about one order of magnitude less compare with σcalc in calixarene and its complexes with CH3COOH and CCl3COOH. It may be explained by low conductivity boundary formation at these conditions between grains in process of target sample preparation for conductivity measurement. The work was supported by Russian Foundation for Basic Research, project no. 18-08-00423 A.